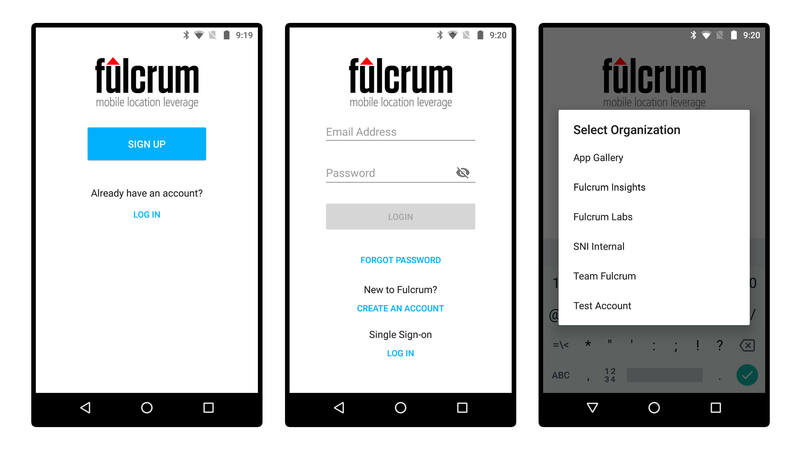 Overview of the Fulcrum for Android mobile app. When you first sign into Fulcrum, if you are a member of multiple plans you will be asked which organization you would like to access. Then you will be taken to the map view of an app you have access to on your device. You can sync your device at any time by tapping the circular “sync”” button located on the top menu bar. You can change the selected app by tapping on the current loaded app’s name in either the map or list views. If there are records on the map, you can edit them from here by tapping the icon to open up a view of the data fields. A few of the options may be found in the overflow menu, such as: Google's Place Search and Zoom All Records. The amount of options found in the overflow menu will depend on the screen size/resolution of the device being used. Additionally, the map and list view buttons on the left side of the bottom menu bar work as a “view toggle.” You can only click the map view button while in the records list view, and vice versa.